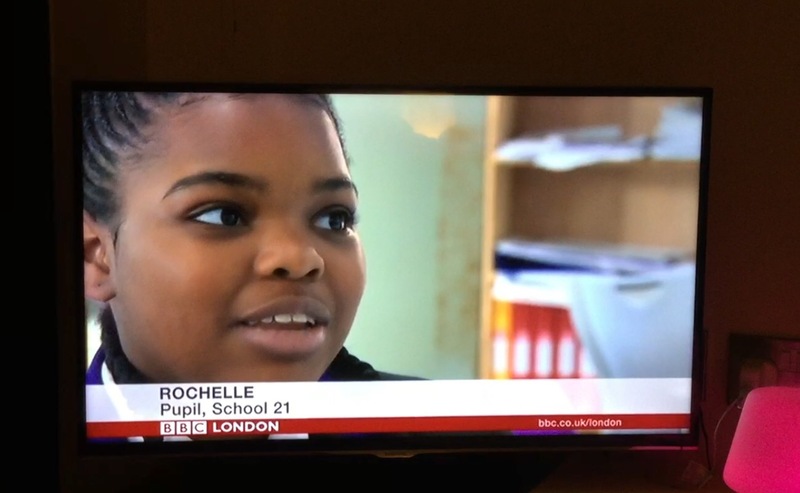 I’ve just watched our year 9s on BBC London’s evening news talking about their project to create a report modelling the potential impact of three proposed new concrete factories on air pollution in our local area. It was brilliant to see them speaking eloquently, enthusiastically and earnestly about the project and the very real threat to our community that the plans pose. Excitingly, this amazing opportunity stemmed from the very scary uncontrollable authenticity I wrote about in my previous blog; it arose from an unexpected curve ball thrown at us in the client meeting with OPCRD member James Durrant at the start of this project. He asked, ‘how can you use the power of your youth voice to spread the word about these concrete factories?’ This was not part of our project plan. We were writing a mathematical report. We sat on his question for some time, and it wasn’t until a sticking point in the maths that we returned to act on it. Three weeks before the Christmas holiday, we realised we had spent several weeks exploring an avenue for data collection that slowly revealed itself to be unhelpful. The obvious frustration of this for both us and the students also led to an issue in English; with no data coming through, we ran out of things to write up. I felt really strongly that we should not engineer purposeless, inauthentic writing, and so in the 3 week gap that presented itself we turned out attention back to our parked thoughts on James’s challenge; how could we, 14 students and 2 teachers, spread the word to the thousands of people across London needed to meet the petition requirements? One of the group’s initial ideas involved harnessing the power of national media to share our message. And, inspired by some of the article we had been reading in our reciprocal teaching sessions to learn about the project, they named the Guardian, BBC, Evening Standard and Newham Recorder as their targets. Achieving this however would require something outside of all our experience; what do you actually need to do to get serious press to cover your work?! The first 2 drafts of our group written press release. – Reciprocal teaching sessions a ‘how to write a press release’ article from the guardian which was formed into a checklist. – A series of structured debates around what our news actually was and what we needed to get across. – 4 drafts of a press release created through shared writing sessions with the whole group and mini teams within the group. The focus shifted on each critique and redraft from mimicking a newspaper tone (and writing in the 3rd person) through improving vocabulary with high level connectives to a formalising session. Students were editors, nit picking for commas around subordinate clauses or the correct usage of a semi-colon, and creators, arguing over the merits of one word over another for reader interest. – Throughout, a continuation of our weekly contextualised ‘mastery’ sessions – from our ‘grammar gym’, practicing challenging new sentence forms to our ‘word of the week’, where new tier 2 vocabulary is learnt robustly. One student’s grammar gym work focusing on using subordinating connectives. The final press release was typed up and sent to the news agencies identified earlier in the term this Monday (we decided to wait for the January return to work so as to not get caught in a Christmas lull). 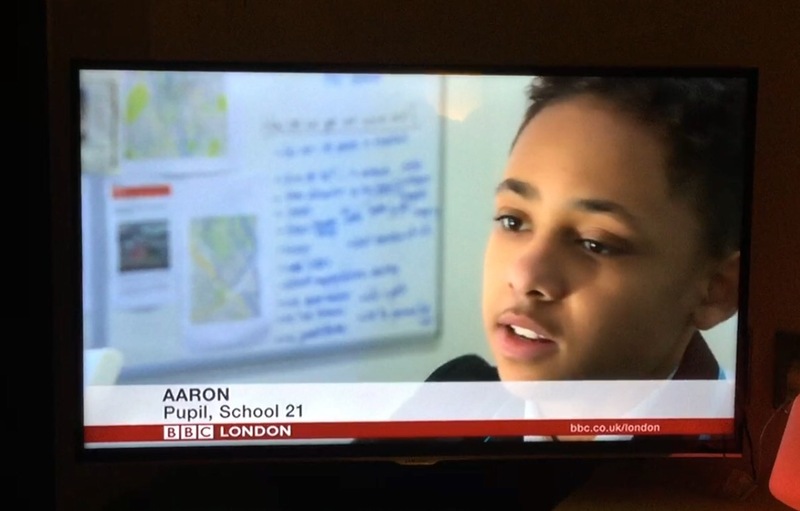 In 24 hours we had a call from the BBC, and then another 24 hours on they were in filming the students. But the real success here for me is the rigourous teaching of authentic non-fiction writing that led up to this. It may have been an unplanned extra outcome, but the learning and mastery behind this product was what we have been working for and building to all term. As I write this, the over-planned, control-hungry side of me still feels a niggling discomfort with the lack of pre-planning that this exposes. I still ask myself if this swerve is allowing anything to slip through the gaps or if this unplanned change of direction mid project damages continuity of learning. But I feel fairly confident that this is not the case. In fact, in the final outcome and the future writing of these students, I feel we will see significant benefits for this. It’s interesting though as when looking at a project, and particularly the moments of outcome, that much criticism is levelled at the learning that has taken place. Where is the rigour, people ask? What significant content have they actually explored? How much did students actually do? And actually I think often this ‘product’ or outcome hides the wealth of work and craft that led up to this moment – it is the tip of the iceberg of the stuff we’re really grappling with; and the stuff we’re really proud of.